The medical device industry & tax impact. Digital communication is gaining adoption and acceptance by consumers; 1 in 4 say they have caregivers email or text them, and most are satisfied with the experience. 73% of people are concerned about data privacy, especially the expansion of access to personal health information. Over one-half of consumers read reviews of health providers online, primarily for physicians and hospitals. The physician is still the #1 touchpoint for consumers in terms of faith in their ability to improve the health system — above government, consumer advocates, hospitals, insurers, employers or pharma. 50% of consumers said politics is the main obstacle to improving the U.S. health system. 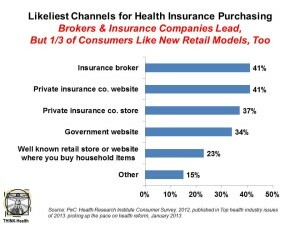 People are more open to new forms of buying health care, via retail channels, as the chart illustrates. PwC conducted surveys among 1,000 consumers, along with insurers and health executives, in 2012. Health Populi’s Hot Points: Among the top ten issues cited by PwC, several more macro topics weave together to tell an important story about the growing role of consumers in health care in 2013, and well beyond. Start with the employer’s historic role in providing health insurance to workers. The proportion of employers offering insurance has declined over the past decade. Will implementation of the ACA drive companies away from providing this highly-valued benefit? PwC says this is a turning-point year for this issue. With health costs ranking in the top three cost categories for companies after workers’ wages, the issue is top-of-mind for employers’ C-suites and shareholders. Some employers could turn to state health insurance exchanges — now re-termed “marketplaces” by the Department of Health and Human Services as of January 22, 2013 — to fill the role that companies have played since World War II in America. Consumers, then, will play a greater role in selecting health plans and/or managing consumer-directed health plans that put more decision-making responsibility on them. These are new muscles for U.S. health citizens, who have long benefited from employers’ human resource departments (and their benefits consultants) vetting of health plans and prescription drug programs. This vetting has also been done for provider networks, where plans rule in (or out) doctors and hospitals based on criteria (e.g., quality, outcomes, re-admission and infection rates, and other metrics). Consumers, too, once taking on the mantle of being a “consumer,” could be more involved in expressing opinions about their experiences with health plans, physicians, hospitals, products and medical supplies. “Consumer ratings hit the pocketbooks of healthcare companies,” PwC predicts. Thus, health care stakeholders must behave increasingly like consumer goods companies, better understanding peoples’ motivations to co-create health with these organizations. These are new muscles to build for those organizations, where transparency hasn’t been their modus operandi in light (or opacity) of quality and price. Finally, payers — especially consumers — will be looking at the value of products and services. PwC calls out the pharma industry on this, saying that physicians who had been the “primary arbiters of pharma value” are now being supplanted by insurers and large providers. But consumers, in a value-based and consumer-driven environment, also have an important lens over this issue at the point of copay, coinsurance, self-pay at retail prices. How best to communicate value to these various audiences, each of whom plays a role in decision making and payment for pharma? Again, a new competence in consumer understanding and health behavior is in order. The opportunities are ripe for those in industry to look the emerging health consumer deeply in the eye, behave transparently, offer high-value (in the eyes of consumers) and support services to help this new consumer navigate and co-create health in a transforming health system. This report is clearly declaring the role of the consumer to be trending in the right direction: up. And that's how it should be. The whole system was set up to take care of the patient at its core. Finally power shifts are moving toward this. Empower the consumer, there's nothing wrong with that.